Labour's plan for a north Wales metro transport system excludes Anglesey, Gwynedd and Conwy because it is an "urban concept" for heavily populated areas, the first minister has said. Carwyn Jones told BBC Wales the north-west needed "rural solutions" instead. 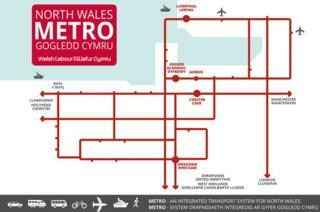 The north Wales metro would include trams, upgraded railway stations and better bus services, Labour says. In February, Mr Jones told the Daily Post newspaper the network would be running by around 2035. Labour's assembly election manifesto commits the party to "starting work on the development of a north Wales metro" if it retains power on 5 May. On Thursday, Mr Jones said: "Bear in mind a metro is an urban concept for areas that are heavily populated," Mr Jones said. "You don't apply an urban solution to a rural areas, you apply rural solutions. "What does that mean? Continuing to subsidise bus services where they're needed." Mr Jones said it also meant "connecting communities", ensuring long distance bus routes "continue to prosper", electrification of the north Wales main rail line and improvements to the A55. Labour has not announced how much a north Wales metro would cost, but fulfilling plans for a south Wales metro have been estimated to require more than £2bn and take until 2030. The Conservatives have pledged to create a new arm's-length body to ensure an integrated transport system across Wales, and promised a long-term strategy for road, rail and public transport networks. Plaid Cymru has promised the "biggest investment programme since devolution in all parts of Wales" to improve public transport. The Liberal Democrats say they would establish regional transport authorities responsible for "re-regulating" local buses, ensuring the completion of major projects such as the south Wales metro and improving connections. UKIP has promised "major investment" to widen the most congested sections of the A55, and to upgrade the A470 and A483.